When reading a book my first stop is often the bibliography – I believe a book can be judged to a certain extent by the quality (although not necessarily the quantity) of its sources, and it can also offer an insight into the author’s point of view or train of thought. The bibliography for ‘Six Weeks’ is certainly comprehensive and at some points reads like a ‘who’s who’ of the war – including Graves, Sassoon, Macmillan, Eden, Asquith, Blunden, among others. Generally well educated these men (and boys, as many often still were) served as junior officers during the war and articulated themselves through their letters, diaries, or poetry. Their recollections form the basis of this exploration of the life, and death, of the junior officer. The seamless narrative takes us on the journey from enlistment and training through to the reality of life in the trenches, leading the men, going into battle, and ultimately being killed or wounded, and for those that survived the post-war difficulties that they faced. Many of the men are brutally honest in their writing, and are often almost casually accepting of injury or death. The burden of leadership may have weighed heavily on their shoulders, but their upbringing and education had instilled in them a deep sense of duty, patriotism, and authority – qualities all required in a good officer. The focus of the book is on the public school contingent who, at least initially, formed the bulk of the subaltern recruiting pot. However particularly later on in the war less educated men became officers too, in many cases commissioned from the ranks. Although this is touched upon it is not really developed further; I suspect mainly because these men were less prolific in their literary output and relinquished their status as ‘temporary gentlemen’ after the war. 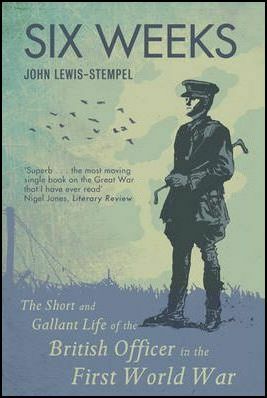 As a study of the subaltern at war this book is without parallel and provides a fascinating insight into the mindset of the typical subaltern and the class and background from which he came. The bibliography attests to the depth of research that has gone into the book, and the overwhelming message is that of the subaltern as the backbone of the British Army, providing leadership and organisation whilst often resigned to his fate – a fate that indeed befell many.